A fascinating way to read through the Bible in one year . . . in only fifteen minutes per day! Now you can gain a better understanding of the order of biblical events and the historical context in which they unfolded. The One Year Chronological Bible arranges the entire Bible text - books, chapters, and even verses - in the order the events actually happened. In The One Year Chronological Bible, prophetic books are interwoven with the historical accounts they accompanied. Psalms follow the events about which they were written. Proverbs are placed in the time frame in which they were compiled. The life of Christ is woven into one moving story. And Paul?s letters to the young churches in the first century are integrated into the book of Acts. You do not have to be a Bible historian to appreciate the fascinating new perspective waiting for you in The One Year Chronological Bible. 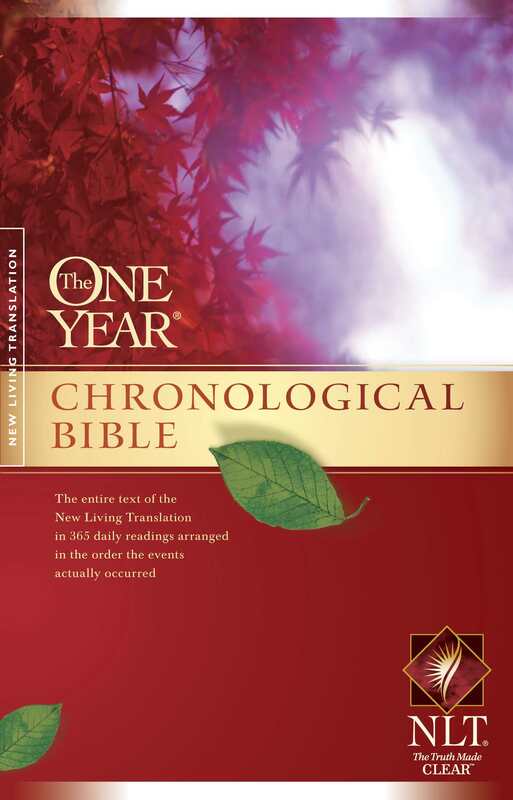 NLT One Year Chronological Bible : Paperback by New Living Trans 2 was published by Tyndale House Publishers in November 2007 and is our 11253rd best seller. The ISBN for NLT One Year Chronological Bible : Paperback is 9781414314082. Bought this for my hubby. He enjoys reading it. The reading portions are quite long, so would take 15 mins for a person who reads quite a lot. As a whole, bible is designed well. Definitely, the best part of this bible is it helps us to understand how and when things happened and were happening chronologically . I was disappointed that it's not arranged like the one year Bible with reading from OT and NT for each day. If i followed this arrangement, I wouldn't get to the NT until 25 sept so I also read from the NT part of this book, ignoring the dates. I like the across the page layout and font size, making the text very easy to read. I'm hoping that this year I'll get through all the OT - for first time ever! Got a question? No problem! Just click here to ask us about NLT One Year Chronological Bible : Paperback. What order is the NLT One Year Chronological Bible: Paperback in? A:The Bible you are enquiring about contains 365 readings, one for each day of the year, starting with the beginning of Genesis on January 1st. This product arranges the whole Bible in the order the events actually happened in.